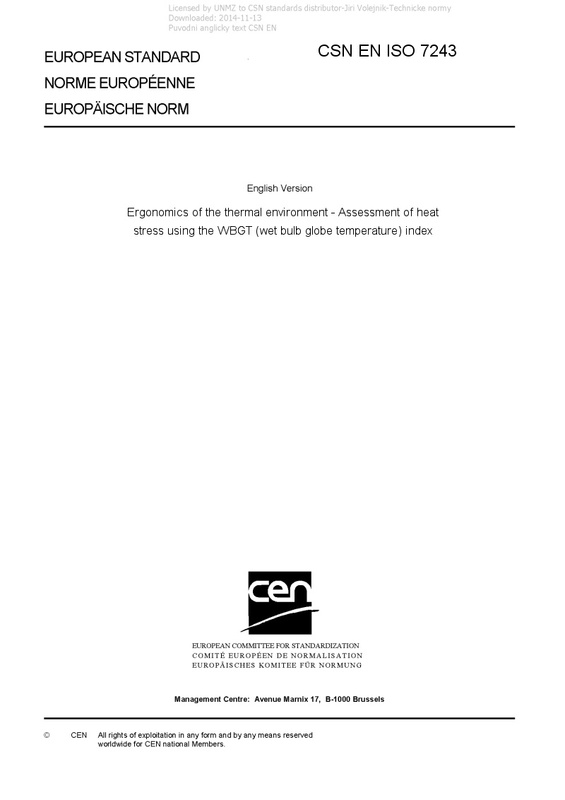 EN ISO 7243 Ergonomics of the thermal environment - Assessment of heat stress using the WBGT (wet bulb globe temperature) index - ISO 7243:2017 presents a screening method for evaluating the heat stress to which a person is exposed and for establishing the presence or absence of heat stress. It applies to the evaluation of the effect of heat on a person during his or her total exposure over the working day (up to 8 h). It does not apply for very short exposures to heat. It applies to the assessment of indoor and outdoor occupational environments as well as to other types of environment, and to male and female adults who are fit for work.